The actual Automobile Age in Iceland began in 1913 when the first Ford T car came to Iceland. 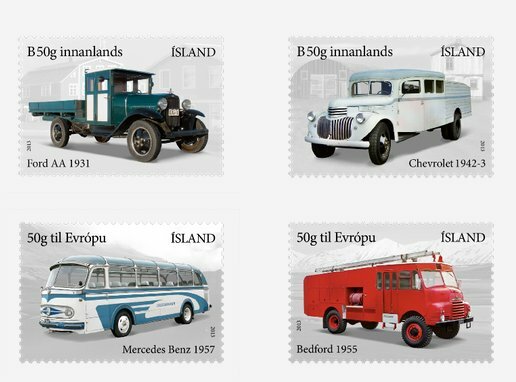 The stamps depict four old automobiles, The Ford Model T lorry, The Chevrolet dual purpose vehicle, Mercedes Benz passenger vehicle and Bedford fire engine. The actual Automobile Age in Iceland began in 1913 when the first Ford T car came to Iceland. 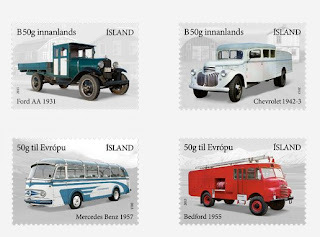 The stamps depict four old automobiles. Ford Model T lorry. Cars of the type T Ford proved that cars were the most suitable means of transport for Iceland. Ford T was a reliable, simple and relatively inexpensive car. The lorries arrived in Iceland without superstructure. The Icelandic design of the drivers’ cabins and platforms for imported lorries was unmatched anywhere in the world. The Chevrolet dual purpose vehicle like the one stamp shows seated 10 passengers. The car was built in 1942 and was new when it was imported in 1943. It was used for transporting goods and passengers in Eyjafjordur. It is now preserved in the Museum of Transport in Óslandshlíð in Skagafjordur. Mercedes Benz passenger vehicle (bus) is depicted on the stamp. The car is a 1957 model, imported in 1962 and used on the Siglufjordur route for 10 years until it was sold to the East of Iceland where it was used for a few more years. The car is now on display at the Museum of Transport. Bedford fire engine. In the mid-late 20th century 68 fire engines of the type Bedford were imported to Iceland. Up to that time only fire pumps had been used and the arrival of the Bedford fire engines was considered the greatest revolution in fire prevention in rural areas.